Dear participants of the Congress and guests! Dear participants and guests of the Congress! I am sincerely happy to welcome you to the hospitable land of Kazakhstan. Let me express my deep gratitude to the spiritual leaders, representatives of international organisations, politicians and experts for supporting our initiative to convene the Congress and for personally participating in its work. 15 years have passed since the first historic Congress was held here. Today we are gathering for the sixth time. I am very pleased to see our old friends again –those that participated in previous meetings. I am also glad to welcome those who are visiting Astana for the first time. This year our capital is celebrating its twentieth anniversary. The well-known principle of “unity in diversity” is the true philosophy of the Kazakh capital. 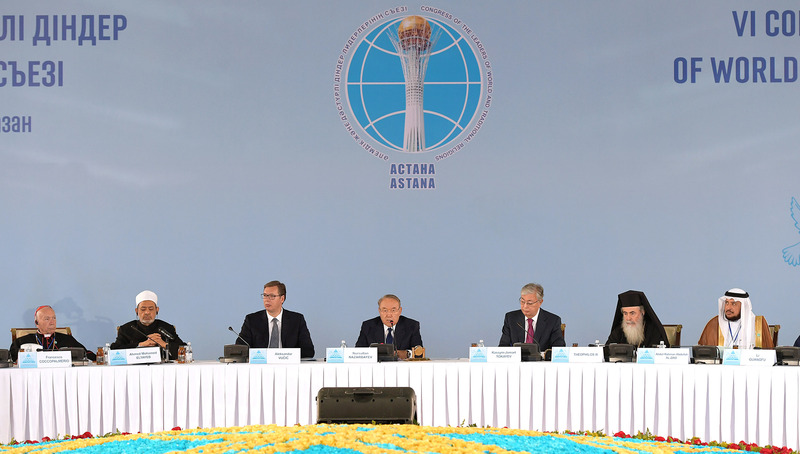 Astana has become known to the entire international community as the place that attracts peace-making processes and unifying initiatives. Our capital is characterised by a special spirit of solidarity, mutual respect and tolerance. Inter-civilisational conflicts look absurd against the backdrop of scientific and technological progress. But at this very moment the shape of the future of humanity is being formed. In what condition will we pass on our common planet to future generations – this is the main civilisational problem. We see that the situation has worsened. New walls, new “iron curtains” are being built between countries and geopolitical blocks. Let’s face it: this is a deeply erroneous, dead-end path. Therefore, our common duty is to facilitate a return to the highway of progress. Postponement is unacceptable here, because humanity is paying for it an incredibly high price every day – the fate of innocent people. Every year, as a result of natural disasters, an average of 24 million people fall below the poverty line. Millions of people are forced to leave their homes. According to the UN, 14% of the world’s population is persistently malnourished. The total number of unemployed has exceeded 190 million people. This reinforces social inequality as a breeding ground for radicalism. For this reason, the central issue is a safe, fair world. Taking an active part in the work of the UN Security Council as a non-permanent member, Kazakhstan is fully and unequivocally in favour of taking urgent measures to solve global problems hindering human progress. However, a safe world cannot be achieved only by the efforts of the UN Security Council. Today, all of us, including religious and public figures present in this room, as well as politicians, must do their bit to overcome the global crisis of confidence. Naturally, spiritual leaders should speak out. You represent religions, which are all unique. However each religion fully recognizes universal human values, the unity of moral principles. Secondly, we are not using enough of the enormous potential that lies in our aspirations for peace. It is necessary to reach for a new level of interaction. I suggest to all spiritual leaders to appeal to the world community for peace and security. One of the global problems of our time to this day is the lack of affordable education. 750 million people globally can neither read nor write. Poverty and misery cannot be overcome without substantially utilising knowledge and science. Religious education in this context is also extremely important. Currently various pseudo-religious organisations are actively using this platform. Therefore, world and traditional religions could work to separate religious values from political ideologemes. I set forth my vision of global anti-war measures in the Manifesto “Peace. XXI Century”, which proposes the creation of a world without nuclear weapons on the 100th anniversary of the United Nations. In order to jointly implement the initiatives I have proposed, I am ready to establish the Centre for the Development of Inter-Confessional and Inter-Civilisational Dialogue. I fully understand the scale of this goal. But at the same time I realize the power that spirituality has. The clash of civilizations is not a fatal choice. It is in our power to change it. We must unite all our aspirations in search of a harmonious world order. I want to wish everyone fruitful work, an open and useful dialogue and positive decisions. We are really grateful to the Holy See for the huge and useful work in supporting our forum. I would like to present this award in your presence. In addition, a number of religious leaders were awarded state awards and commemorative medals of the Congress. On my behalf, they will be handed over to you by the Head of the Secretariat of the Congress, the Chairman of the Senate of the Parliament of Kazakhstan, Kassym-Jomart Tokayev.